What is the DATE Function? The DATE Function in Excel is categorized under Date/Time FunctionsFunctionsList of the most important Excel functions for financial analysts. This cheat sheet covers 100s of functions that are critical to know as an Excel analyst. It is the main function used to calculate dates in Excel. The DATE function is very useful for financial analystsFinancial Analyst Job DescriptionSee a real Financial Analyst Job Description including all the skills, experience, and education required to be the successful candidate for the job. Perform financial forecasting, reporting, and operational metrics tracking, analyze financial data, create financial models because financial modelingWhat is Financial ModelingFinancial modeling is performed in Excel to forecast a company's financial performance. Overview of what is financial modeling, how & why to build a model. A 3 statement model links income statement, balance sheet, and cash flow statement. More advanced types of financial models are built for valuation, plannnig, and requires specific time periods. For example, an analyst can use the DATE function in Excel in their financial model to dynamically link the year, month and day from different cells into one function. 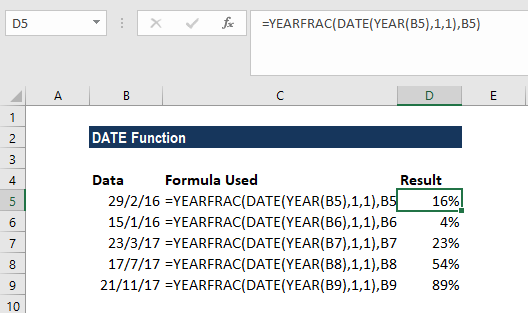 The DATE function is also useful when providing dates as inputs for other functions like SUMIFS or COUNTIFS since you can easily assemble a date using year, month, and day values that come from a cell reference or formula result. Year – It is a required argument. The value of the year argument can include one to four digits. Excel interprets the year argument according to the date system used by the local computer. By default, Microsoft Excel for Windows uses the 1900 date system, which means the first date is January 1, 1900. Month – It is a required argument. It can be a positive or negative integer representing the month of the year from 1 to 12 (January to December). Excel will add the number of months to the first month of the specified year. For example, DATE(2017,14,2) returns the serial number representing February 2, 2018. When the month is less than or equal to zero, Excel will subtract the absolute value of month plus 1 from the first month of the specified year. For example, DATE(2016,-3,2) returns the serial number representing September 2, 2015. Day – It is a required argument. It can be a positive or negative integer representing day of a month from 1 to 31. When day is greater than the number of days in the specified month, day adds that number of days to the first day of the month. For example, DATE(2016,1,35) returns the serial number representing February 4, 2016. When day is less than 1, this function will subtract the value of the number of days, plus one, from the first day of the month specified. For example, DATE(2016,1,-15) returns the serial number representing December 16, 2015. 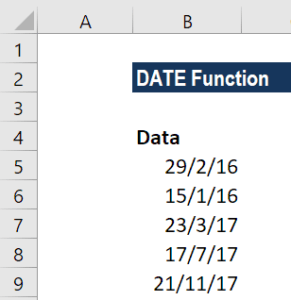 How to use the DATE Function in Excel? Suppose we need to calculate the percentage remaining in a year based on a given date. We can do so with a formula based on the YEARFRAC function. #NUM! error – Occurs when the given year argument is < 0 or ≥ 10000. Suppose while using this function you get a number such as 41230 instead of a date. Generally, it will occur due to the formatting of the cell. The function returned the correct value, but the cell is displaying the date serial number, instead of the formatted date.